Good morning. This is Wayne Tustin. Sometimes I’m called “Mr. Random Vibration,” about which I’ll teach here at Santa Barbara next month and at other cities in the coming months. You might want me to teach at your facility. I also teach via CD-ROM, with lessons coming to me via e-mail. We thank Bruel & Kjaer for this web time and the Chicago Chapter of the IEST for arranging these presentations and for inviting me today to discuss “Vibration Aspects of Reliability Enhancement via HALT, ESS and HASS”. What are those acronyms all about? 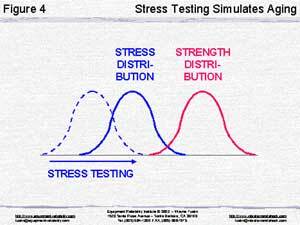 … both the loads (blue) and the strengths (red) are distributed in some manner. 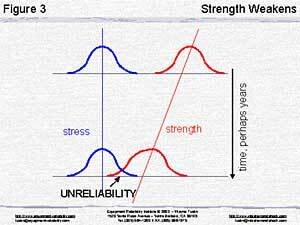 We’re OK, of course, if our weakest product is stronger than the most severe load we encounter. Problems arise over time. 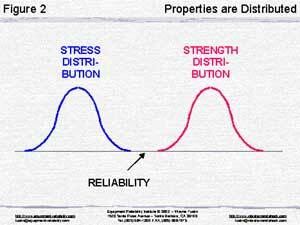 Product strength can deteriorate, so that it is possible for an occasional severe load to exceed the strength of an unfortunately weak product. In that situation, failure can occur. We can’t wait years to find out if that’s going to happen. Our bosses and our customers want to know now that we have a reliable product. 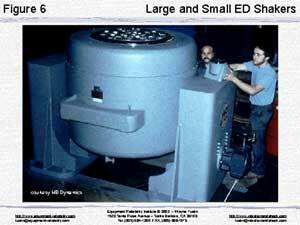 So in our test laboratory we increase loads until we get a failure. 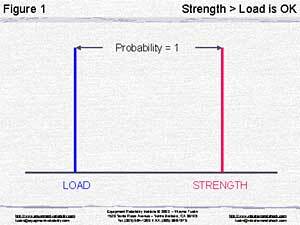 What kind of loads? Some labs use thousands of on/off cycles. Most labs use rapid thermal ramping + random vibration. The latter is my subject today. Much of what I’m saying traces back to 1979. Here I want to acknowledge one of my heroes, Willis J. Willoughby and his NavMat document P9492, shown here. 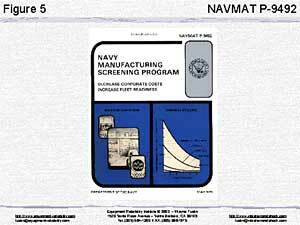 First the Navy, then the Air Force and the Army called for environmental stress screening (ESS), utilizing thermal ramping + 6g RMS random vibration. They required ESS of military electronics contractors. Reliability improved greatly. Many commercial manufacturers adopted ESS. … on the same principle as electrodynamic loudspeakers. Here, however we have direct current flowing in a field winding. This creates a strong magnetic field across this gap. 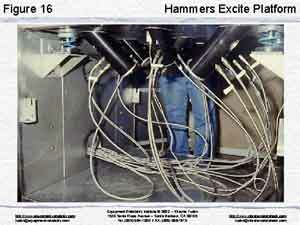 That’s where vibratory force is generated by alternating current flowing in the driver winding. Force travels up through the armature to the table surface where test articles are mounted. 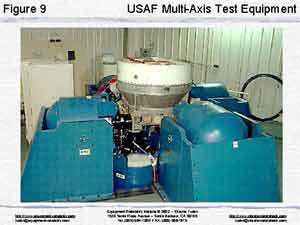 The armature and test articles vibrate together. 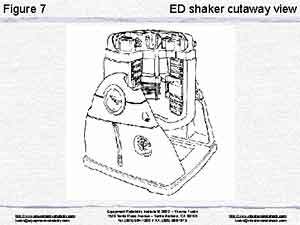 Often the ED shaker is combined with a thermal chamber for thermal ramp stressing combined with random vibration. Thus far, we’ve only discussed single-axis-at-a-time shaking. For years, we have settled for vibrating our products in their X axis, stopped the test, turned our product into its Y axis, stopped the test and finally turned our product onto its Z axis. That is not very good simulation, is it? 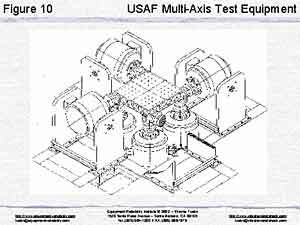 Will you agree with me that “real world” shaking is multiple-axis-simultaneous? … as well as torsionally in roll, pitch and yaw. Another reason is that multi-axis stimulation is more effective and saves screening time. While the Air Force can perhaps fund such an installation, not many companies can. They might consider three ED shakers coupled to a common platform, as in this videoclip from Anco, set just now for maximum displacement. Anco also offers a six-shaker version that adds roll, pitch and yaw. Realize that each shaker requires …. 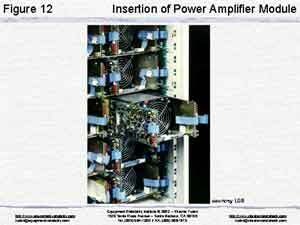 … the final power amplifier module is being installed. 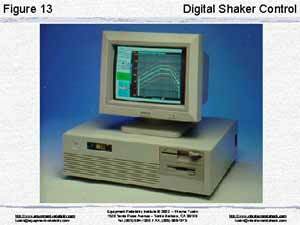 Each ED shaker also requires a channel of digital control. Here the operator preadjusts intensity of random vibration in units of g2/Hz over the desired frequency spectrum for each shaker. 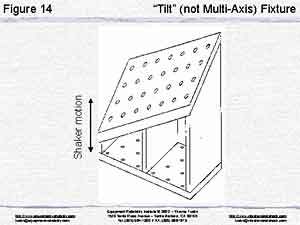 You will probably hear some claiming that you only need one shaker, that a “tilt” fixture such as this, skewing the test article relative to the shaker’s single axis, provides multi-axis vibration. Don’t believe it. Yes, there is a component of motion in each of the test article’s axes, but those motion components are highly correlated. In the “real world” motions in the several axes are uncorrelated. Thus several independent shakers are needed. 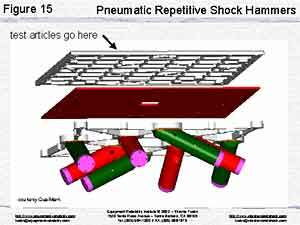 Much less expense (and much less control) is possible with a number of hammers – repetitive shock devices driven by plant air. Note that they drive a platform in X, Y and Z directions, also in roll, pitch and yaw. Articles to be tested or screened are attached to the top of the platform. 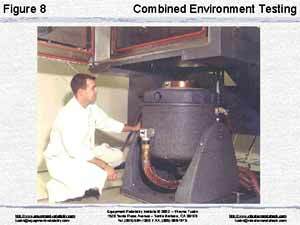 … forms the bottom of a thermal chamber, so that test or screening articles receive thermal stressing + repetitive shock. 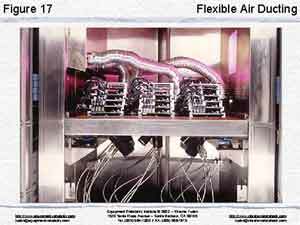 Conditioned air, sometimes hot and sometimes cold) is ducted for high air velocity through and across the articles being screened. CRIQ in Montreal developed another approach for multi-axis random excitation of printed circuit cards. 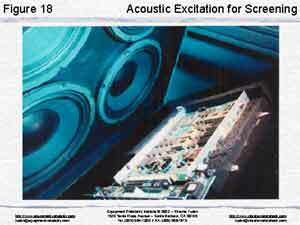 They use several loudspeakers to create vibratory responses in cards. 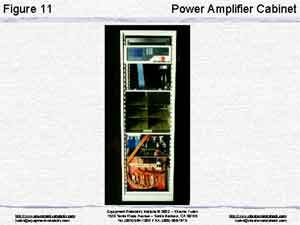 This approach offers spectral control, as with ED shakers, but at much less cost. Here are some upcoming “open” courses which you might attend. Santa Barbara in February is not considered to be punishment. I’m lucky to live here. While you are at our website, please see the details of these courses. Or consider having us “tailor” training to meet your needs, for presentation at your site. Details about distance learning training are also shown. Thank you for participating. If your computer had difficulty with the video clips, or you didn’t hear me clearly, the presentation has been posted at our website. Visit our website and find many free resources to enhance your vibration and shock knowledge. Check out our technical glossary and our quarterly newsletter.